“Camphor increases prana, opens up senses and brings clarity to the mind, eases headache and awakens perception. It is a good stimulant and counter-irritant for joint and muscle pain”, says Light Miller and Bryan Miller in their book Ayurveda and Aromatherapy. Botanically known as Cinnamomum camphora, Camphor is a member of the Lauraceae plant family and is extracted from the wood and bark of this evergreen tree. Prevalently called as Karpura in Ayurveda, this sacred and aromatic herb is used in Ayurvedic healing for more than thousands of years in the treatment of bronchitis, insomnia, asthma, hysteria, whooping cough, epilepsy, dysmennorhea, sinus headaches, nasal and pulmonary congestion, delirium and gout. No sacred or religious ritual in India gets fulfilled without Camphor and is also known in Ayurveda with other names like Chandra, Himavaluka, Ghanasara and Chandra Prabha. Popularly called as ‘the tree that does not sleep’, Camphor has been an important natural remedy especially in the Traditional Chinese Medicine and Ayurveda for more than 4,000 years in the treatment of various illnesses including nervous afflictions and other psychosomatic problems. Indigenous to Formosa, Japan and China, this tree can grow up to a maximum height of 100 feet and the traditional Chinese used Camphor for its remedial uses and its wood was used in building temples and ships mainly due to its exuberant aroma and robustness. During the Tang dynasty (C.E. 618-907), Camphor was used in flavoring confectionery items like ice cream in China. Camphor is an important part of Indian prayers, especially the religious ceremonies of the Hindu community since the traditional times. Burning camphor in the Pooja plate for deities is a part of every prayer in temples as well as homes and this sacred flame is calmly touched and its warmth feeling is passed on to the eyes. It is a part of the biggest spiritual celebration of the Hindus known as Mahashivratri dedicated to Lord Shiva. The ancient Egyptians, Babylonians, Greeks and Romans used Camphor as a fragrant wood, incense resin, flavoring agent and as fumigants for embalming. It was given as prestigious gifts by the Chinese emperors for other kingdoms including the Arabian treaties. Camphor was also used as a traditional remedy for plague in Iran and Persia. 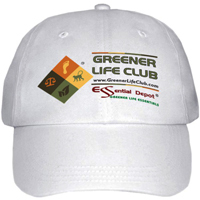 The strong aroma of Camphor makes it an excellent agent for protecting against snakes and other poisonous reptiles. It was also used as an insect repellant as it is trusted to be toxic to insects. Camphor was also used in tool chests to guard tools against rusting. 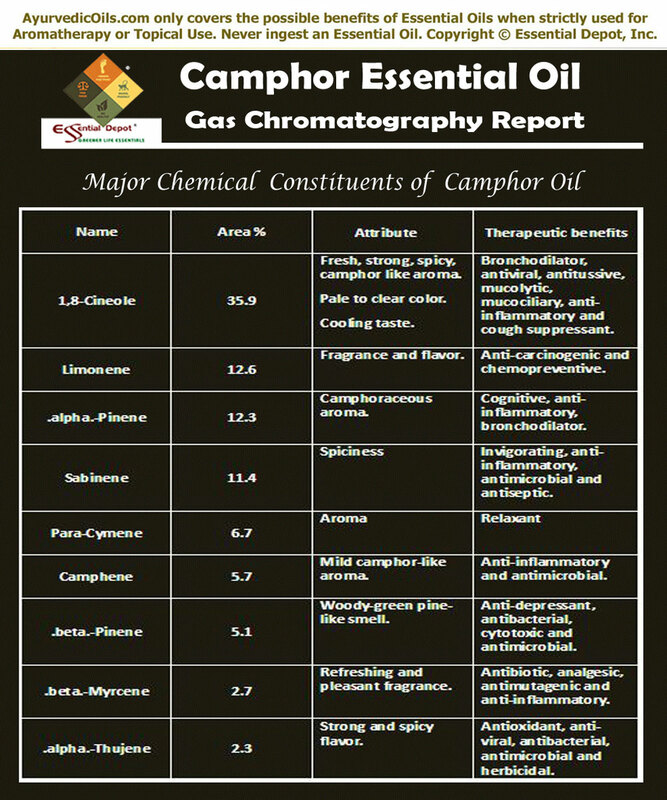 The Gas chromatography report witnesses Camphor oil with about 15 chemical constituents that contribute to its unique aroma, therapeutic values and consistency of this oil. Among which, 1,8-Cineole is the key component with about 35.9% of Camphor oil. I believe that this information would certainly help you in having a clear picture about the primary chemical constituents of Camphor oil. The table crafted below explains the unique nature and therapeutic qualities of these biochemical constituents to the curative values of Camphor essential oil. The remedial properties of this oil are stimulant, expectorant, antiseptic, anti-rheumatic, antispasmodic, decongestant, nervine, anti-phlogistic, analgesic, anti-arthritic and bronchodilator. Ayurveda is a holistic healing science known to the world for more than 5,000 years. The most prominent thing about Ayurveda is that its healing practices are recorded systematically in the form of literature. Among the 4 major sacred books of the Indian Mythology, Atharvana Veda records the Ayurvedic therapies and about 114 verses of this sacred book shares the symptoms and diagnostic techniques of numerous health disorders. Ayurveda is a holistic healing system that treats the individual instead of the symptoms and traces the root cause of an illness. By this way, this ancient common sense science focuses on prevention of illnesses leading through healthy aging process to longevity. Based on the Vedic references of Ayurveda, two ancient Ayurvedic texts were written by the legendary Ayurvedic physicians known as Charaka and Sushruta, who wrote Charaka Samhita and Sushruta Samhita. These Ayurvedic encyclopedias state that everything is a part of nature and the human body is a combination of the five elements known as Panchamaha Bhoothas, namely fire, water, earth, air and space. Every person is made up of a unique individual constitution that consists of three dynamic energies known as doshas (vata-air & space, pitta- fire & water and kapha- water & earth), which are a combination of the elemental forces of nature. For a person to be hale and healthy, these doshas should always remain in a specific ration as set by nature and any change in the functioning or the balance between these doshas cause illnesses. Imbalance of these biological energies mainly occurs due to food habits (mainly depending on the quality of the food taken), change in weather conditions and lifestyle changes. Ayurvedic remedies like plant essential oils, herbs, yoga, meditation, prayers, Abhyanga or the art of Ayurvedic massaging, Panchakarma or the detox technique and Ayurvedic routine are recommended based on the Prakriti or the unique individual constitution of a person and for correcting the imbalances of doshas. 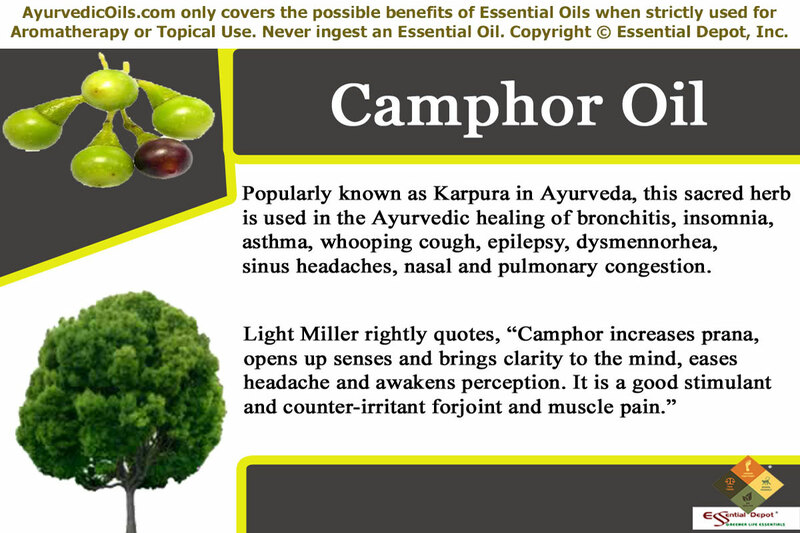 Camphor essential oil has the potent to reduce kapha and vata doshas and increase pitta dosha. Camphor essential oil has antispasmodic, analgesic and anti-inflammatory properties that render itself as a promising pain reliever. The stimulating and counter-irritant effects of this oil relieve even severe muscular and joint pains. With its anti-rheumatic and anti-arthritic attributes, Camphor essential oil assists in promoting blood circulation, eliminating toxic deposits in the joints and the entire system through urine and sweat and supporting the functions of the circulatory system. Ayurveda states that rheumatic problems mainly occur due to excess of kapha dosha leading to surplus deposits of water, toxins, salt and uric acid in the system, especially in the joints. Camphor essential oil has the power to reduce kapha dosha and help in discharging ama or toxins in the system along with excess water content in the body. This oil works by anesthetizing the sensory nerves of peripheral nervous system, thus reducing inflammation. Massaging the affected or painful parts with 2 drops of Camphor oil blended with 2 drops of Eucalyptus oil and 2 drops of Frankincense oil with 4 ml of coconut oil can be a great aid in reducing inflammation, swelling, painful muscles, redness and stiffness associated with rheumatism and arthritis. This massaging can also help in relieving cramps, abdominal spasms and stiff joints. Adding 2 drops of Camphor essential oil to bathing water can bring in a feeling of newness, coolness and tranquility, especially during the summer season and can also help in alleviating pain and inducing peaceful sleep at night by relaxing the muscles, calming the nerves and cooling the senses. 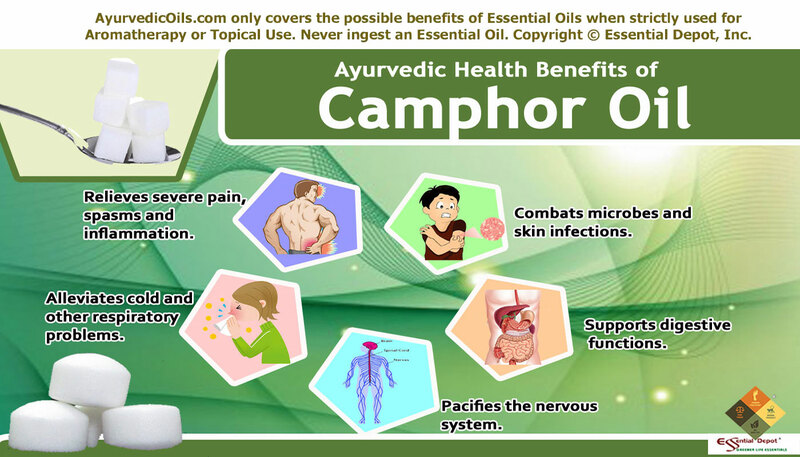 The essential oil of Camphor oil has been a prominent ingredient in numerous ointments and medications for treating skin infections caused by bacteria, fungi and other microbes. This is attributed to the germicide, disinfectant, anti-microbial and insecticide properties of Camphor oil. 2 drops of Camphor oil mixed with 1 ml of coconut oil can be applied on minor burns, itches, wounds, rashes, insect bites, nail fungus, cold sores, eczema, acne, chapped lips, athlete’s foot and ringworm. Camphor is an excellent cleanser that helps in disinfecting the system when added to the bath tub (about 2 to 3 drops). 2 drops of Camphor oil with 2 drops of Rosemary oil added to your shampoo can help in treating dandruff and lice. This also helps in granting a cooling effect on the scalp and prevent unnecessary hair fall due to dandruff and lice. Being a carminative, Camphor oil works wonders in relieving gas and flatulence. Gas in the intestines and stomach, when left unnoticed raises above slowly and causes sharp and severe pain in the chest, which may even lead to difficulty in breathing. Using Camphor oil assists in relieving gas and prevents the formation of gas. Along with this, the diaphoretic effects of this oil aids in normalizing metabolic functions, enhancing circulation, improving sluggish digestion and controls the appetite. Mix 2 drops of Camphor oil with 2 drops of Juniper oil along with 2 ml of sesame oil and massage it gently on your abdomen for expelling gas and supporting the functions of the digestive system. Camphor oil treats nervous afflictions and pain in the nervous system by causing numbness. This is attributed to its anesthetic effects. It is a proven remedy for treating neuralgia, which is a relentlessly painful condition caused due to the force on the Ninth Cranial nerve created by the swollen blood vessels surrounding it. Gently massaging the system with 2 drops of Camphor oil, 2 drops of Eucalyptus oil, 2 drops of Juniper oil and 2 drops of Wintergreen oil blended with 5 ml of almond oil can help in reducing inflammation and lessen the pressure on the Ninth Cranial nerve, thus treating neuralgia. This can also assist in lessening the negative effects of epileptic attacks, nervous convulsions, chronic anxiety and nervousness. Camphor essential oil has a sharp, strong and medicinal aroma that makes its presence vital in numerous decongestant ointments and vaporubs. Vicks vaporub, the most popular decongestant has Camphor as one among its therapeutic formula. Camphor oil has been in use since the traditional times mainly for its effectiveness in treating respiratory ailments. Excess kapha is the major reason behind the built up of mucus and phlegm deposits causing congestion and other respiratory problems. Camphor oil lessens kapha dosha and discharges mucus and phlegm in the respiratory and nasal passages. Massaging your chest, throat and back with 1 drop of Camphor oil mixed with 1 drop of Eucalyptus oil and 1 ml of olive oil along with 2 drops of Camphor oil added to steam inhalation assists in relieving congestion in the respiratory tract, nasal passages, bronchial tract, pharynx and larynx. Adding to 1 to 2 drops of Camphor oil to warm bathing water can also help in loosening the mucus and phlegm and clear the respiratory system. It is being used as an excellent cough suppressant since the primordial period. The powerful decongestant and bronchodilator properties of Camphor oil makes it an excellent remedy for treating asthma, sinusitis, pulmonary congestion, bronchitis, nasal congestion, whooping cough, common cold, chest congestion and cough. This article is only for informational and educational purposes. It is not intended to replace any prescribed medication or professional medical advice or to cure, treat or prevent any illnesses. We are not medical professionals and this information is shared only with the idea of enlightening the mass with the traditional healing values of Ayurveda, the 5,000 year old medical system. Do not use essential oils internally unless it is prescribed by your medical professional. Dilute essential oils before using it for topical purposes as organic and pure essential oils are very concentrated liquids and may cause allergic reactions if used on the skin directly. Consult your Ayurvedic expert/healthcare professional before picking up the perfect essential oils for your health condition and unique individual constitution. Ensure that you use very less amount of Camphor oil as prescribed by your medical expert, as excess use of Camphor can act as a narcotic poison. 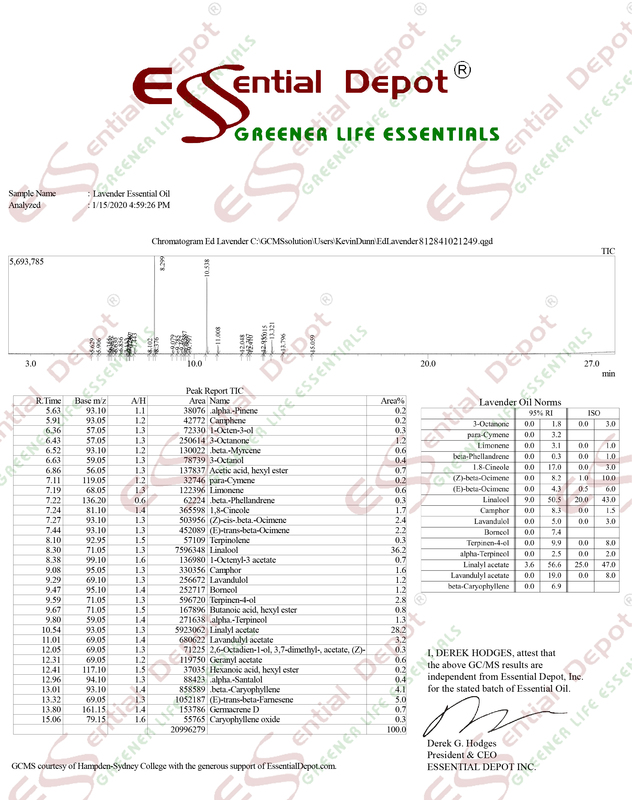 The MSDS (Material Safety Data Sheet) of Camphor oil is readily available for your enhanced safety and better usage. Camphor oil has been acclaimed as lethal and highly toxic in various studies, when used in excess of the prescribed quantity. According to the safety report, the acute toxicity of Camphor oil is said to be exhibited by contact with the skin, eyes, inhaling and ingesting, however ingestion of Camphor oil should be avoided strictly mainly due to its chronic effects on the liver (hepatotoxic – toxic to the liver). The major chemical constituents in Camphor oil, responsible for its skin sensitization, allergic reactions, irritation and autoxidation are camphene, 1,8-cineole (abnormal respiration and CNS depression, epigastric pain and cold sweats), limonene and a-pinene. Oils with limonene and a-pinene are responsible for oxidation and oxidized oils cause sensitization and irritation of the skin. Using Camphor oil topically might also cause skin sensitization, irritation, skin allergies like hives, itching, rashes, swelling of the face and lip dryness. Camphor oil used as direct contact with the skin without any dilution in appropriate carrier oils is considered as a dangerous skin irritant. Never use Camphor oil on cuts, broken or peeled skin. It is highly recommended to avoid Camphor oil during pregnancy and breastfeeding, as it gets quickly absorbed by the placenta and may cause physical and neurological damage to the developing fetus and in nursing mothers there are possibilities of Camphor being absorbed through skin cracks and pass on to infants through milk (might cause damage to the infants’ liver and central nervous system). Do not use Camphor oil on patients with bronchitis, asthma, epilepsy and Parkinson’s disease, as it can cause convulsions, increase spasms, seizures (by accounting to chemical disparity in the brain) and worsen the situation. It is also not recommended for high blood pressure patients as it is frequently used in the treatment of low blood pressure. The safe level of use of Camphor is up to 3% dilution in case of liniments. As per the Dutch Information Medicamentorum, the safe usage level of Camphor is 20 to 100 mg/g for chest rubs, 0.15 mg/ml for nasal sprays, 20 to 50 mg/g for nose ointments, 1 to 70 mg/g for pruritus lotion and 40 to 250 mg/g in oils for muscular pain. However 11% is regarded as the maximum level of safe usage in all kinds of dermal applications. Camphor, according to the Poisons Information Monograph, an International Programme on Chemical safety states that the major risks of ingestion of Camphor are renal damage, colic, anxiety, convulsions, nausea, delirium, gastric irritation, irritation of the mucous membrane, asystole, apnoea, chronic post-convulsive coma and difficulty in breathing occur after ingesting about 2 grams of Camphor (acute toxicity level) and 4 grams are possibly lethal for adults and 1 gram for children and may cause death. This report also denotes that the major target organs for Camphor damage are the upper respiratory tract, liver, kidneys and the central nervous system. Certain studies witness the immediate collapse in infants soon after the application of Camphor to their nostrils.